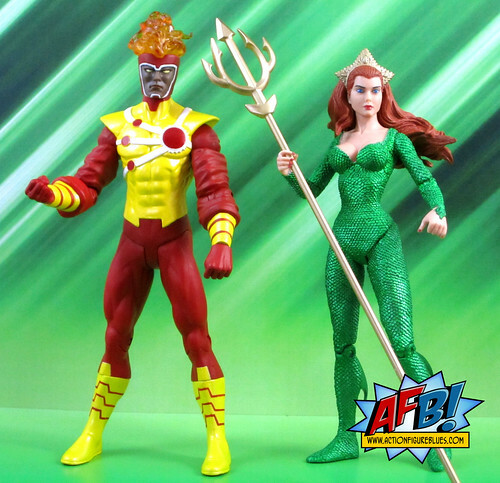 Mera and Firestorm dawn with DC Direct's Brightest Day! I’ve been cherry picking DC Direct figures for some time now, and have been mainly sticking to characters or versions of characters that have never been produced. 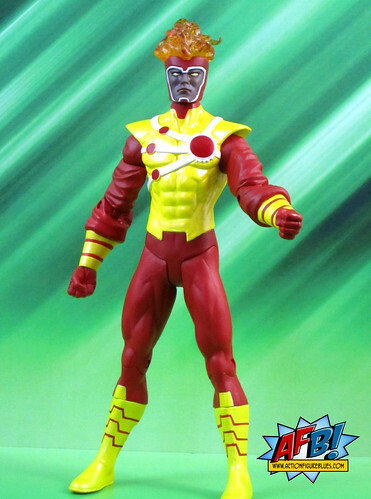 Next in my DCD review queue are the figures I chose from DC Direct Brightest Day Wave Two, which were Mera and Firestorm. If you know me at all, you know that Aquaman is my favourite superhero, so buying Mera’s first proper appearance in 6” form was a no-brainer! As much as it pained me that DC Direct released the Blackest Night Red Lantern version of Mera first, all is now forgiven. I am delighted to have DCD’s Mera on my shelf! 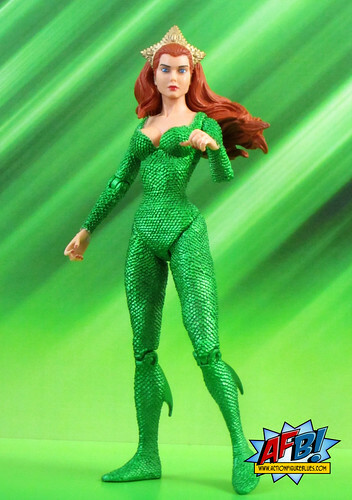 While I expect that Mattel will eventually bring us a Mera figure, there are elements that DCD brings to their action figures that will always keep this one a step above. Firstly, the female buck that Mattel uses for DCUC really is the greatest weakness of the line, unless you like your women with stick figure limbs and flat faces. While DC Direct doesn’t match Mattel’s articulation, they do sculpt beautiful female forms, and the effort on Mera is certainly no exception. Her hair is beautifully sculpted, and her pose is excellent. The second element that DCD brings is the finish. The texture that has been used here for the scales on Mera’s uniform is fantastic! It not only creates a scale effect, but almost a sparkle effect as well. It’s great look at but also sturdy to touch and it seems that it will wear well. The only thing that keeps Mera from a perfect score in my book is the switch DC Direct has made from painted faces to coloured plastic. It doesn’t have the same effect, and it really drops the figures down a notch in my book. Nothing’s going to keep me from enjoying this great version of Mera, but it’s this bit of cost-cutting that keeps her from perfection. While nothing compares to my Aquaman mania, I am definitely a Firestorm fan as well, and as this figure is meant to be a representation of Jason Rusch and Ronnie Raymond sharing space in the Firestorm Matrix for the first time, I thought it deserved a spot on my shelves. One of the things I liked about this figure from the solicits is that the skin tone seemed to represent a mixture of Jason and Ronnie’s ethnic origins, so I was disappointed when the actual figure turned out to look more like a straight representation of Jason with his darker tones. Now, that is in no way a comment about the tones themselves - I would have been just as disappointed if it was a straight representation of Ronnie. The point is that the mixed skin tone in the solicits wasn’t achieved in real life, and to me that defeats the whole purpose of the figure. A real shame. While it’s a pretty significant issue to me, it’s the only thing I can fault on this figure, which is beautifully sculpted. Very nice touches include the translucent material used for Firestorm’s “flame-head” and the sculpted detail on his uniform, which easily could have been just painted on. It really is a quality action figure in every regard - which makes the skin tone confusion all the more disappointing. While I have an issue with each of these figures, I am still glad to own both - but of course Mera is the star of not just the wave, but the Brightest Day series. She’s a beautiful piece and a much needed addition to a plastic DC Universe! Mera does indeed look good! 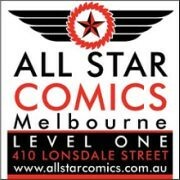 How does she measure up (scalewise) to the DCUC Aquaman though? I was going to ask the same thing. I would love a Mera to go with my DCUC Aquaman, but am torn about whether to get this one or court heartbreak by waiting for a DCUC Mera. Hey - they did Blue Devil and El Dorado, right? I'm gonna get that Mera she looks great.